Coco Rocha is back for yet another season as the face of Longchamp’s ad campaigns. 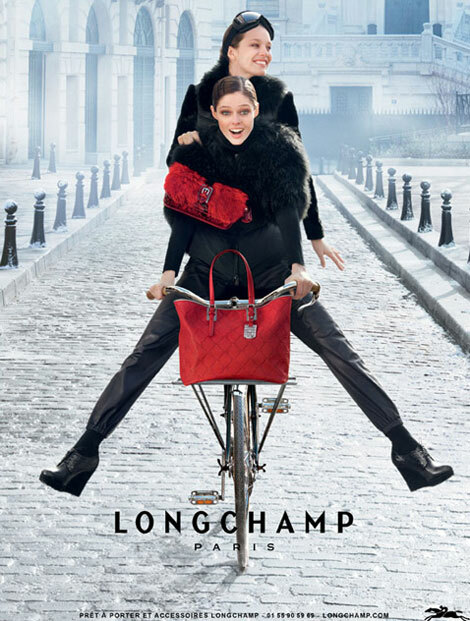 The Longchamp Fall Winter 2012 2013 ad campaign looks fresh and really funny. Coco brought a friend to enjoy the ride: Emily Didonato is also part of the advertising campaign as photographed by Max Vadukul. The styling is impeccable, the girls look like having loads of fun with their striking red bags and contrasting black outfits. I’m getting a really good vibe from this campaign. Then again, Coco makes all her campaigns looking joyful and lovely, doesn’t she?